Johnson's Cotton Bud - Set of 100 | Multicolour | Gently cleanses and caress the ear canal or remove earwax. 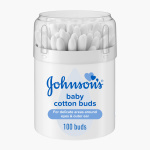 Maintain health and hygiene for your little one as you add this set of earbuds to the list of essentials. Soft and gentle to use, the buds caress the ear canal and remove ear wax efficiently. Feature 2 : Extra soft to your baby delicate skin. Feature 1 : Gently cleanses and caress the ear canal or remove earwax.